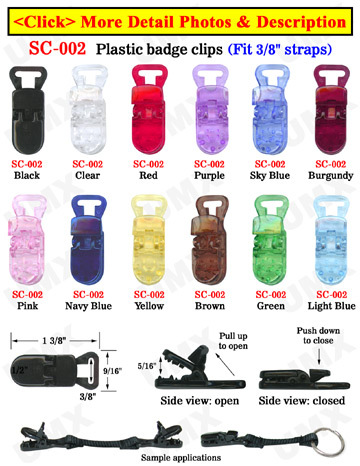 Our Best Seller - Plastic, Colored Clips! Combine Bags To Get Price Break! These plastic clips are made from a high quality acrylic material commonly used as badge clips, nametag clips, pacifier clips, hat clips, and x-ray scan-free devices. Special Sale! - Can combine bags (must be 100pcs per bag/per color) to get the total price break! 1) Question: Can I combine several colors to make-up 100 pieces to purchase by bag to get the total price break? Ans: No, In order to get the total price break, you MUST order at least 100 pieces of the same color per bag. 2) Question: Can I combine several small orders, up to 100 pieces, by the dozen per color to get the total price break?